Assemblywoman Kimberly Jean-Pierre (D-Babylon) announced she is accepting nominations for the 2017 Women of Distinction Awards in honor of Women’s History Month. 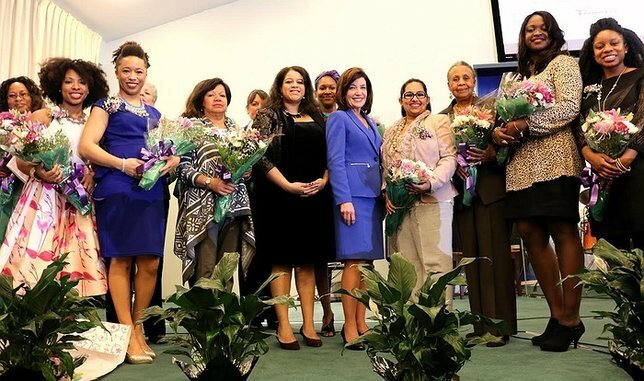 Assemblymember Solages and Lieutenant Governor Kathy Hochul stand with the 2016 Women of Distinction honorees. Photo by: The Office of Assemblymember Solages. Lindenhurst, NY - February 17, 2017 - Assemblywoman Kimberly Jean-Pierre (D-Babylon) announced she is accepting nominations for the 2017 Women of Distinction Awards in honor of Women’s History Month. The annual Women of Distinction Awards recognizes women who have made an impact in the community in fields including education, business, health care, volunteerism and community service. To nominate someone you know, visit online or contact Jean-Pierre’s office. Nominees must reside in the 11th Assembly District, which includes portions of the town of Babylon – ­­­such as Amityville, Copiague, Lindenhurst, Wyandanch, and Wheatley Heights – and parts of North Babylon, West Babylon, Deer Park, and East Farmingdale.” The deadline for nominations is Tuesday, Feb. 21. The 2017 Women of Distinction Awards Ceremony will be held on Friday, March 3, from 6 p.m. – 8 p.m., at Dominican Village, Helen Butler Hall, located at 565 Albany Ave. in Amityville. Jean-Pierre also invites elementary school students to submit artwork for her Women’s History Month Art Contest. Winners receive an award and have their artwork featured on the cover of next year’s activity booklet. Students can find out more information through their school or by contacting Jean-Pierre’s office. Anyone with questions about the 2017 Women of Distinction Awards or the Women’s History Month Art Contest can contact Jean-Pierre’s office at 631-957-2087 or email. Subject: LongIsland.com - Your Name sent you Article details of "Assemblywoman Jean-Pierre Seeks Nominations for Women of Distinction Awards"